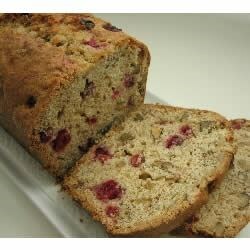 "This is a fast, festive bread for the Thanksgiving or Christmas holiday dinner table. Tart, fragrant and filled with nuts!" In a medium bowl, mix together the flour, sugar, baking powder, salt and baking soda. Cut in the butter until the mixture resembles coarse crumbs. In a small bowl, beat the egg, orange juice and orange zest. Blend into the dry mixture. Stir in the cranberries and walnuts. Transfer to the loaf pan. Bake in the preheated oven 65 to 70 minutes, or until a wooden toothpick inserted at center comes out clean. Cool in pan 10 minutes, remove to wire rack and cool completely before serving. I have made this recipe several times and everyone loves it. I have also made it with fresh bing cherries and it was a hit.